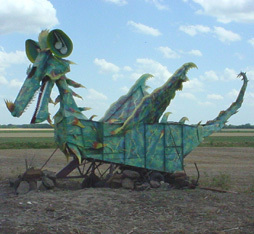 Search for the zany sculptures and creatures of grassroots artist J.R. Dickerman while traveling along Highways 14 & 18. There are birds, dragons, and lots more hiding from hilltops, behind signs, and in fields. Dickerman has been combining scrap metal and parts from cars, trucks, tractors, bikes and field equipment with skulls, bones, driftwood, antlers and just about anything else you could think of to create his magical creatures.